John and I would like to wish our readers and listeners a happy and safe Thanksgiving holiday. We’ll be back with our next podcast on December 5. In this installment of the Technology and the Arts podcast, we will discuss some interesting news, web sites and online resources we have come across recently, including video chat service Tokbox.com and Robert Scoble’s interview with Stanford Prof. Marc Levoy on Advanced Photographic Research. Plus, a look at Google’s Android mobile OS and The Grove, a turntable-based installation at the Aracadia University in suburban Philadelphia through December 20, 2007. Hosts: Brian Kelley, John LeMasney. File size: 20.5 MB. Time: 44 min., 32 sec. 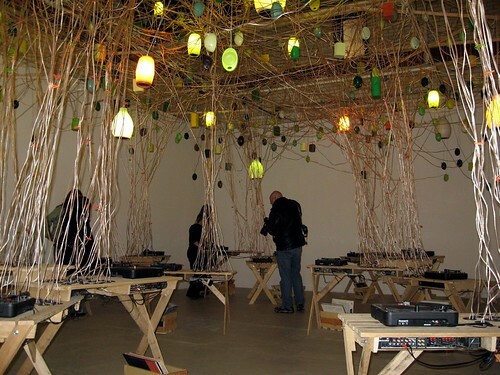 “The Grove” (pictured above) is a traveling installation by Los Angeles-based artist Sean Duffy that is a uniquely participatory project consisting of 18 matching, variable-speed phonographs, each linked to 20 speakers suspended from the ceiling. A wood crate of vintage LPs by instrumental and vocal performers located at each turntable allows participants to change the sound environment interactively. With close to 400 speakers, the installation creates an immersive, orchestral canopy of evolving compositions. “The Grove” is installed at the Arcadia University Art Gallery in Glenside, Pa., just outside of Philadelphia, through December 20, 2007. John received a call for papers for the 2008 Trenton Computer Festival…and he is excited about it. 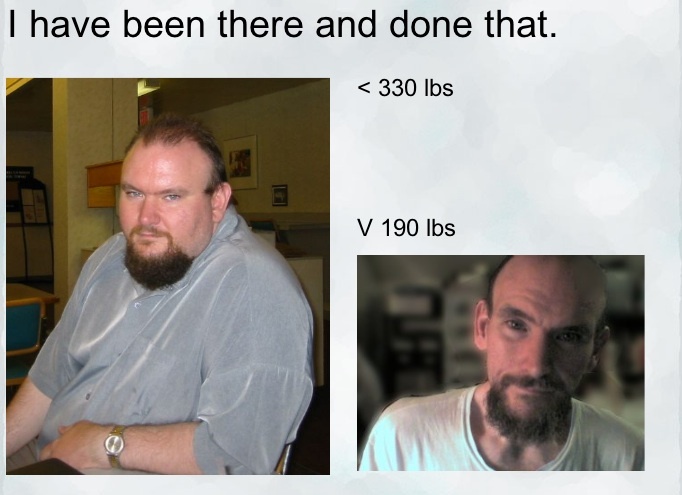 Also, John created this presentation using Google Docs for a talk on his personal weight-loss accomplishments. Here is a then and now photo comparison, which is included in the presentation. In addition, John has posted his recent talk on Open Source Software to the 55Plus Computer Users Group. Brian discussed a new song he has written. Tokbox.com – Free Web-based video chat. Mashable.com’s list of 30-plus Mind-Mapping Tools. Sosymbol.com – a symbol creation/editing and mashup site. Scoble Show: Interview with Stanford Prof. Marc Levoy on Advanced Photographic Research. Google finally announced its open-source mobile operating system, Android, and the Open Handset Alliance. Information Week posted a video produced by Google showing off cool apps running on Android. Here is a CNET take on Android. Some baseball fans learned the hard way about the trouble with Digital Rights Management when Major League Baseball decided to change DRM systems. As a result, video downloads of games purchased under the old DRM system are no longer viewable. Qloud – Music search meets social networking.